Many of us never realized we were adults, until the responsibilities of adulthood came knocking. For some of us, those responsibilities are not unfamiliar, because we have spent most parts of our lives fending for ourselves. While for many of us, we are approaching that phase of our lives very fast. Finally, The National Youth Service Corps (NYSC) Scheme passing out program for 2017 Batch A stream 2 has been confirmed from a reliable source to take place on Thursday, 21st June, 2018. The Federal Government has made provisions for corps members to be covered by the health insurance in the 2018 budget. Corpers don’t need to rely on the doctors in camp. Any youth corper will be entitled to go to any hospital in the location in the local government that is covered by health insurance. In the course of registering for the compulsory National Youth Service Corps (NYSC) scheme, there are mistakes to avoid which has serious consequences. UNILAG prospective corps members can now verify their personal data and send complaints (if any). Jigawa State Government on Wednesday said it has earmarked N270 million for the construction of NYSC lodges across the 27 local government areas of the state. The state Governor, Alhaji Muhammad Badaru, disclosed this at the passing out parade of the Batch A 2018 youth corps members in Dutse. Badaru, who was represented by the state’s Head of Service (HOS) Alhaji Muhammad Tahir, explained that it would cost the government N10 million to build a lodge for NYSC members in each of the 27 local government areas. The Governor of Gombe State, Governor Ibrahim Hassan Dankwambo, has appealed to National Youth Service Corps (NYSC) members posted to different parts of the state for their primary assignments to accept the postings in good faith. He promised that the state government has put in place a reward system to honour deserving corps members who excelled at the end of the service year. About 1,596 corps members of the 2,126 posted to Adamawa state under the 2018 batch “A” for the National Youths Service Corps (NYSC) scheme have rejected their postings to the state. Mallam Abubakar Mohammed, the coordinator of NYSC in the state, made the disclosure in an interview with the News Agency of Nigeria (NAN) in Yola on Wednesday, May 9. The coordinator said that those that rejected their postings had sought redeployment to other states based on insecurity, marriage and health grounds. The FCT Board of the National Youth Service Corps (NYSC) has stopped the sale of alcoholic beverages to corps members in the camp during orientation. Mr Oladimeji Hassan, the Chairman of the board, made this known in an interview with newsmen at the Closing Ceremony of the 2018 Batch ‘A’ Orientation Course in Abuja on Tuesday, 7th May, 2018. Hassan said that the decision to stop the sale of alcohol during the mandatory three weeks orientation camp in the FCT was to enable corps members perform optimally. Akwa Ibom Government has assured the National Youth Service Corps (NYSC) of improved orientation camp with effect from next orientation course in July. Members of the Joint Health Sector Union (JOHESU), Federal Medical Centre (FMC), Asaba, on Thursday raised concerns that hospital management has resorted to using inexperienced laboratory and pharmacy trainees, interns and NYSC members to provide medical services to patients. Health workers under the aegis of JOHESU have been on strike for over two weeks, leading to the withdrawal of services by medical professionals. Anthony Anwukah, minister of state for education, has hinted that the federal government may be considering a mandatory extra year of studies for Nigerian students before entering the labour market. He made this known at a two-day retreat for governing councils of federal universities in Abuja on Tuesday, 7th May,2018. The National Youth Service Corps (NYSC) has increased transport and local allowances of corps members during orientation programmes. A statement by Director Press and Publications department of the scheme, Mrs Adenike Adeyemi said 2018 Batch ‘A’ corps members have lauded the increase when the Director General of the NYSC, Brigadier General Suleiman Kazaure visited the Ebonyi State Orientation Camp. Corps members transport allowance has been increased from N1,500 to N1,800 while the local allowance is now N1,400 against the earlier N1,000. A corps member who was serving in Bayelsa state has been reported dead after falling into a river while trying to take selfie. The man who is yet to be identified was taking a selfie when he met his untimely death. The incident took place at Ogbolomaibiri, Nembe on Friday, May 4. The late corps member was capturing his beautiful moment at the top of a jetty when he reportedly slipped and fell inside the river. His corpse was recovered about 30 minutes later. The management of the National Youth Service Corps,(NYSC), Taraba State, has reacted to the heavy rainfall that caused a major disaster and injured some Corps members at the orientation camp. The occurrence was described by the management as a natural disaster. This followed protest by corps members about the disaster, which led to the injury of an undisclosed number of corps members. The NYSC spokesperson, Mrs Adenike Adeyemi, in reacting to the report said that the rainstorm blew off some of the camp’s roof, injuring corps members in the process. The Director-General of the National Youth Sevice Corps, Brigadier General Zakari Kazaure, while assuring Corps Members posted to serve in Taraba State of adequate security has warned then against evangelism. He insisted that the concern of the corps members should be to serve and not to go and indoctrinate the host communities. Kazaure said these on Wednesday in Jalingo when he visited Corps members currently undergoing orientation course at the NYSC camp, Sibre, near Jalingo. 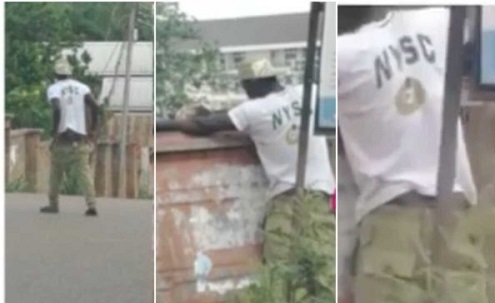 A serving member of the National Youth Service Corps in Enugu state reportedly ran mad in New Haven on Sunday, April 29. It is unknown if the unidentified corps member was abusing drugs or has a history of mental illness. As thousands of the 2017 batch ‘A’ corps members across the country wound up the one year mandatory service to the country, five died during the service year. Coordinator of the scheme in Kaduna state, Dahunsi Mohammed, announced the deaths, at the Passing out Parade (PoP), yesterday. The PoP is the last of the four cardinal points of the NYSC; orientation course, place of primary assignment, community development service (CDS) and the PoP.